Who’s craving something delicious and easy? ? Guys, the struggle is real. I have ZERO energy! I have no idea how I’m going to drag my poor self through now til December 31st. Also, I’m kinda hoping that come the New Year I get a whole 100% boost of energy to be a brand new person in 2016. That’s how it works, right? ? The thing is: I am so exhausted. Deep in my bones exhausted with working the blog plus my survival job, getting everything done for our Brazilian trip, buying Christmas gifts, and trying not to get stampeded by the insane amount of tourists in Time Square right now. Yes, sometimes I feel like little Simba being chased by the wildebeest stampede in the middle of the jungle. Except, thankfully, I do not lose my dad (Mufasa). Only my dignity! 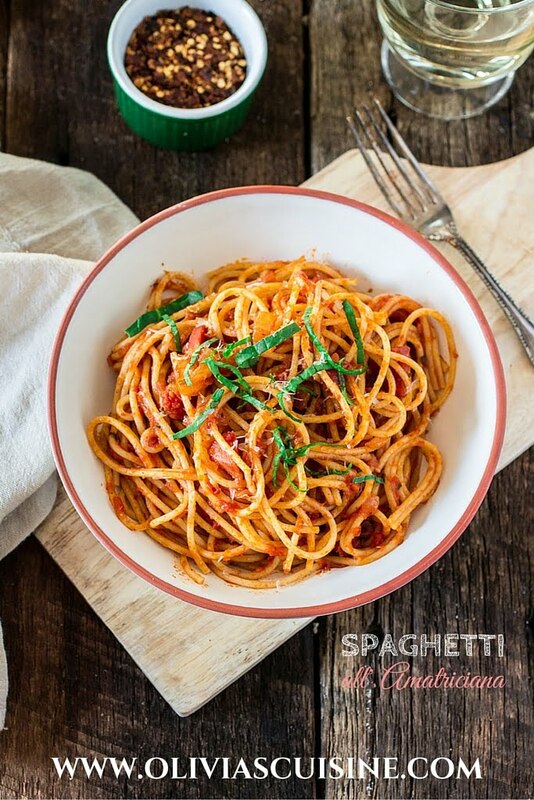 I know you are probably going through something similar, since the holidays are always chaotic for everybody, I thought I would share an easy and quick Spaghetti all’ Amatriciana that will, hopefully, give us the energy to finish this year! 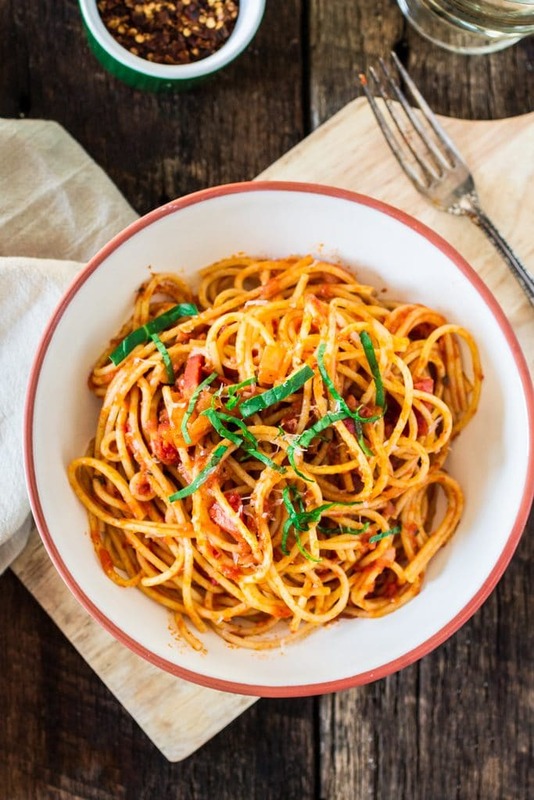 Spaghetti all’ Amatriciana is a traditional Italian pasta dish that originated in the town of Amatrice (in the mountainous province of Rieti of Lazio region). The sauce is traditionally prepared with guanciale (cured pork cheek), crushed tomatoes, chili pepper and grated pecorino. However, as you know, I have difficulty following rules, so I adapted the recipe to use whatever I had in my pantry/fridge. The results were this luscious spicy pasta dish made with pancetta, Bertolli Riserva Marinara with Parmigiano-Reggiano, onions, garlic, red pepper flakes, basil, white wine and some more Parmigiano-Reggiano. Not quite authentic, but equally amazing! ? And, while most people believe you have to serve this sauce with bucatini pasta, the original dish was prepared with spaghetti. 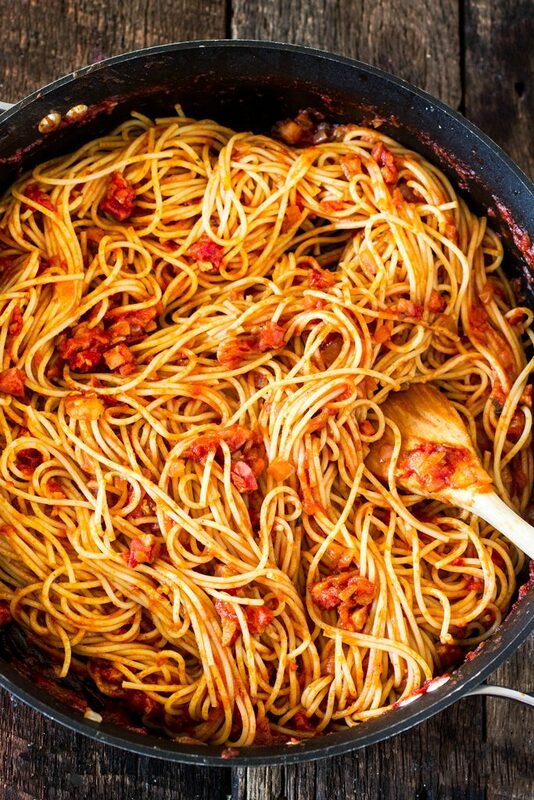 I say: use whatever pasta you have in your pantry. Any type of dry pasta, or even zoodles, works here! Tim went crazy over this dish. By the time I thought of going for some leftovers, they were all gone! He even had it for breakfast. Yes, I am aware that I have a very weird husband… No need to point that out! I do find it funny, though, that he takes a long time to eat the most elaborate dishes I make, but as soon I make something quick and easy, he’ll go nuts about it and won’t stop talking about how great of a cook I am. And I’m like: Seriously? I just cooked some pasta and tossed with a handful of ingredients. But I guess that’s how Italian cuisine goes. Fresh, simple ingredients yet incredibly flavorful results! 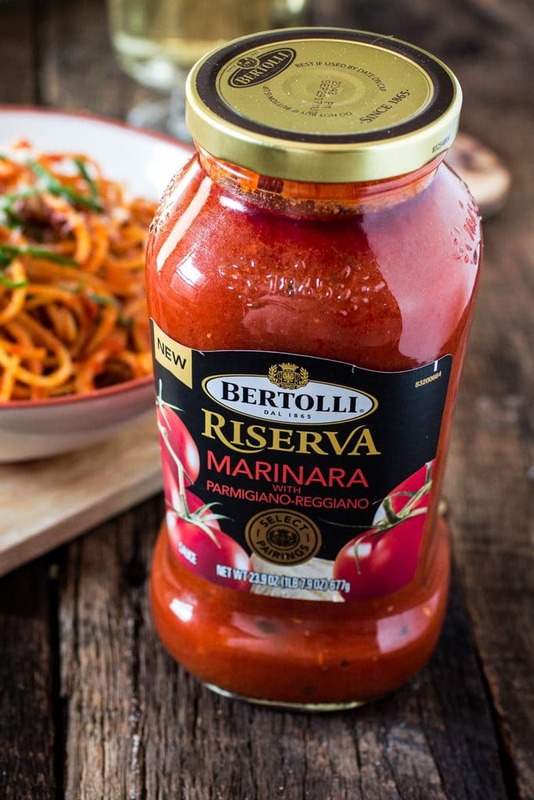 A few months ago, Bertolli released a new line of Marinara sauces called Riserva. I got to experiment with it in October and ending up making a delicious recipe for Arancini di Riso with Balsamic Vinegar and Caramelized Onions Marinara Sauce, where I used their tasty sauce as a dip. This time I picked the Marinara with Parmigiano-Reggiano and, again, it did not disappoint. I really love how fresh the sauces taste, as if they were homemade. Bertolli does all the work for you and all that is left is to open a jar and pour it over cooked pasta. It really doesn’t get much better than that! EXCEPT when the lovely folks at Bertolli decide to be generous and throw a $1.50 off coupon our way so we can buy their product without breaking the bank. Then it gets oh-so-much-better!!! However, as much as I’m sure that you would be happy with just some pasta tossed with Bertolli’s Marinara with Parmigiano-Reggiano, I highly recommend going the extra mile and making this Spaghetti all’Amatriciana. In a large skillet, heat the olive oil, over medium heat, and sauté the pancetta until brown and crispy. Remove with a slotted spoon and reserve. Add the onions and garlic to the pancetta fat and sauté until translucent, about 2 minutes. Add the pancetta back to the skillet (reserving a little bit for garnishing at the end), the red pepper flakes and the white wine. Cook until the white wine is almost all absorbed, about 5 minutes. Add the marinara sauce and once it boils, reduce the heat and simmer for about 15 minutes or until rich and thick. While the sauce is simmering, cook the spaghetti according to package instructions, reserving a cup of the starchy pasta water to use if necessary. Once sauce is thick, season with salt and pepper to taste. Toss the pasta with the spaghetti (using the pasta water if necessary) and garnish with fresh basil and the reserved pancetta. Serve immediately, with some more Parmigiano-Reggiano on the side! P.S. 2 Follow Bertolli on Facebook and Tumblr for some great Italian food inspiration. Also, visit their website for a coupon and 150 ways to bring Tuscany to your table! Great recipe, looks delicious! Love Bertolli sauces! Pinned!